I wasn't expecting to update the blog with roster news on a Sunday, but that's what I'm doing. Per the USHL's Hockey Ops Twitter account, the Lincoln Stars have added forward Jason Stephanik ('94) to their protected roster. To make room for Stephanik, the Stars have released forward Drew Callin, and moved forward Dominick Sacco to the affiliate list. From what I've read online, Stephanik picked up a scholarship offer from Quinnipiac University and was to start there this fall. I don't know if he started at Quinnipiac but left shortly after or if he never enrolled at Quinnipiac. 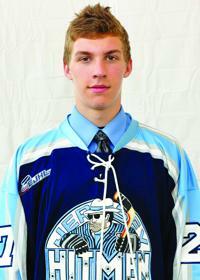 Regardless, it appears he will be playing for the Lincoln Stars for the 2013-14 season. Stephanik, who is originally from Monroe, NY, played the last two seasons for the New Jersey Hitmen of the Eastern Junior Hockey League (EJHL). Jason put up some good numbers for the Hitmen, scoring 93 points (43g, 50a) in 87 games the past two seasons. He also has some good size (6'2", 188 pounds) to go along with his scoring prowess. When looking for more information about Stephanik online, I ran across a number of scouting websites that highlighted Jason as a potential NHL draft pick. However, he was not selected by any NHL teams in the 2013 NHL entry draft. On paper, this looks like a great pickup by the Stars. Stephanik has some good experience at the junior level, and is a proven goal scorer, which this Stars team needs. Thoughts on this latest roster news?